Work on a new studio complex is a complex process consisting of several stages, including the design part, and the installation of the final configuration and debugging of all systems. The main pavilion studio claims to be the most advanced in Ukraine, which combines visual studio thoughtful design and technical component in the form of complex technological mechanism, managed a professional creative team. The Comtel company made the system integration of the project. Work on the new studios of the holding started early enough, as a result managed to work out the details in detail and agree on important issues related to the implementation of civil works related to construction organizations. 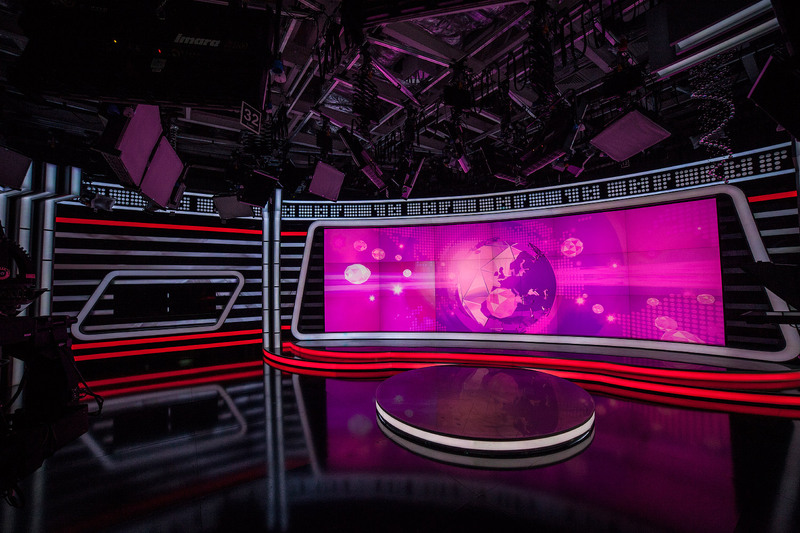 The new studio was made all the necessary range of design work for the installation of bearing metal, corresponding to the requirements of the mechanical suspension system elements and other constructs; It was agreed supply scheme studio and performed placement of panel equipment; prepared cable ducts for low-voltage lines in the acoustic wall studio. 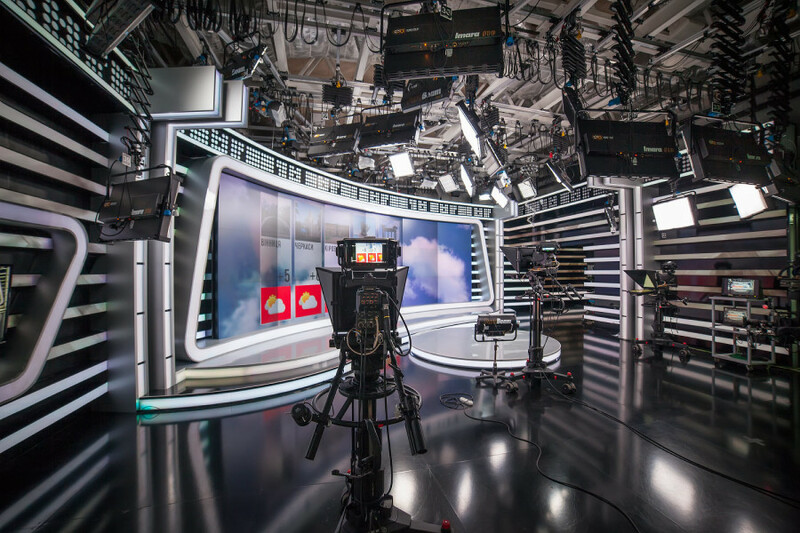 Lighting equipment and control systems presented in the new studio, meet the highest world standards and allow to solve artistic problems of any complexity. In the design, it was decided to abandon the 'hottest' of traditional lighting with incandescent bulbs in favor of more modern and efficient systems: fluorescent and LED. The latest equipment from world famous companies and ARRI Kino Flo perfectly approached for this task. 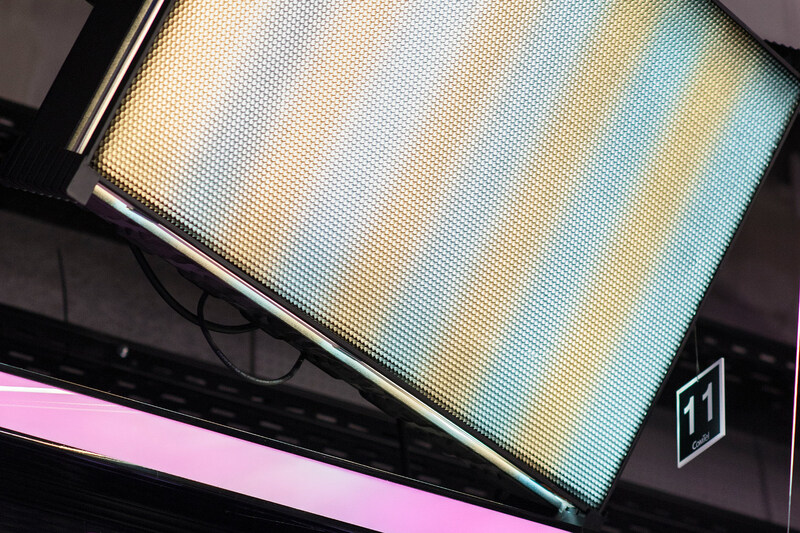 Fluorescent news from Kino Flo Imara combines necessary for such a large pavilion lighting, power and characteristic instrument of softness that makes them the best choice for this project. 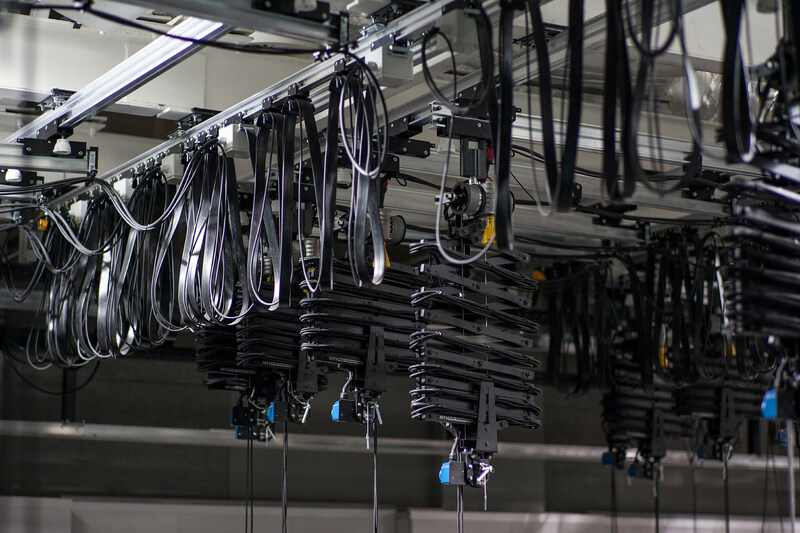 Imara10 devices in combination with Kino Flo ParaBeam400 devices allow you to create multi-tasking light cascade scheme, combining the functions of a spot and fill light with the ability to create the desired lighting solution in any area set on a vast area of the pavilion. 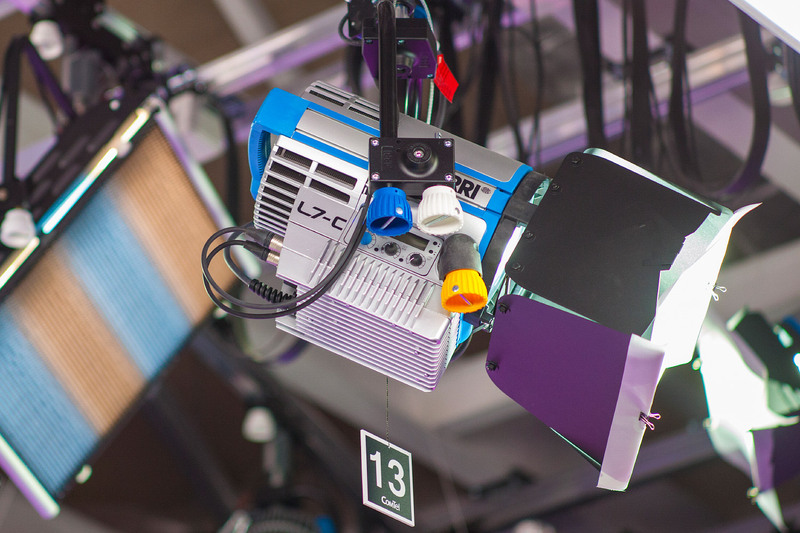 Latest LED devices ARRI L7-C with the possibility of rapid adjustment of the spectral composition of light work for accent positions, backlight and light spectacular. Ample opportunities for setting up these devices range of light up to create color effects to help quickly and easily solve various creative tasks. 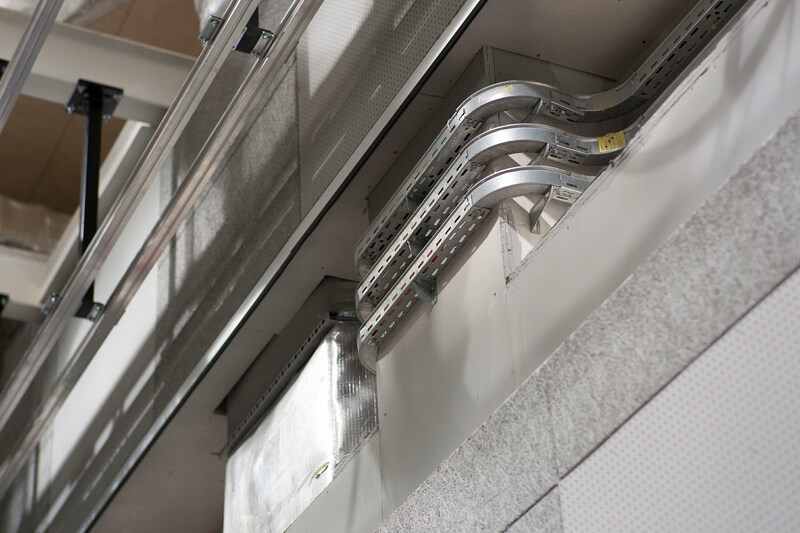 Both studios complex is implemented exemplary and proven to operate the movable rail-carriage system based on 80 mm aluminum profiles. This is a very flexible and convenient solution that allow to minimize the time and resources for adjustment or correction of the lighting scheme. Hanging system consists of five fixed roads, each of which is set at 10 movable traverse. 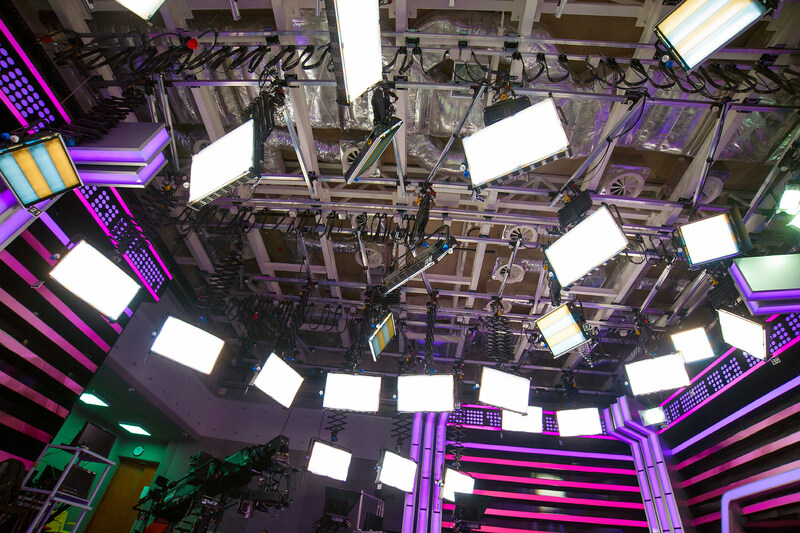 Also, the hanging system includes the backlight 3 monorail and two background road, made of 50 mm aluminum profile. As the basic unit of the hanging system used gear pantographs of MTS, characterized by a high assembly quality, large torque resistance and a high level of rigidity, respectively stability. The project is implemented power flow diagram of the light without the use of stationary dimmer - from an uninterruptible power supply. 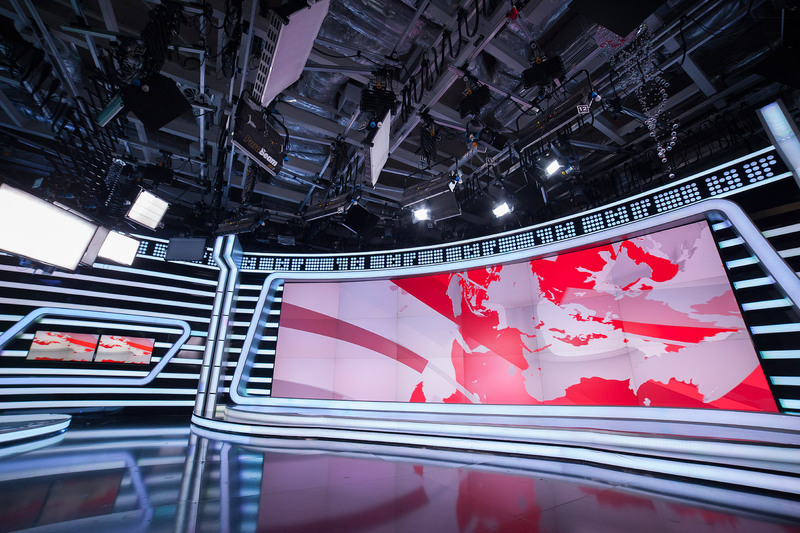 Also from this uninterruptible power supply is provided by the multi-screen display size of 3x6 m, made on the basis of video cubes with Christie rear projection. Power section and DMX control lines are designed in such a way that all moving suspension points (Tool carriage) have a 220V outlet and DMX control checkpoint line. This decision is explained by the use of lighting, most of which are equipped with built-in dimmer and controlled directly by DMX- interface. 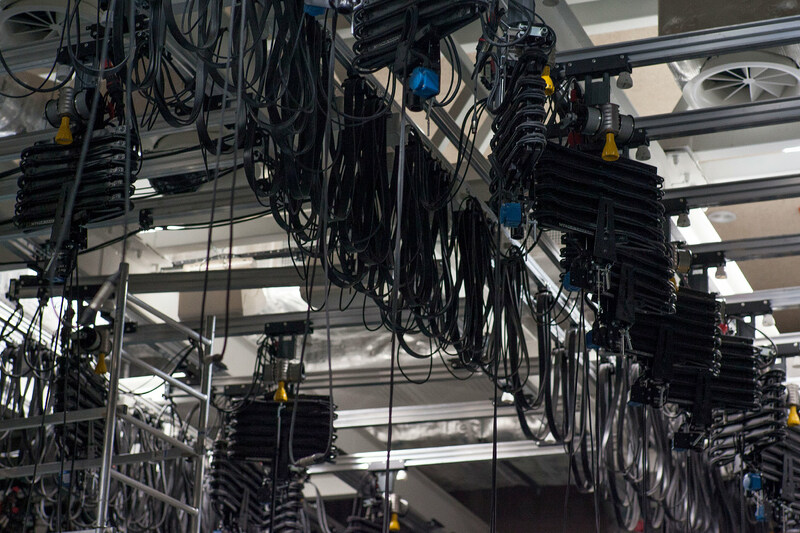 A small number of devices that need individual dimming channel (series ARRI True Blue) equipped with single-channel dimmer units that are installed locally on the mobile traverses. 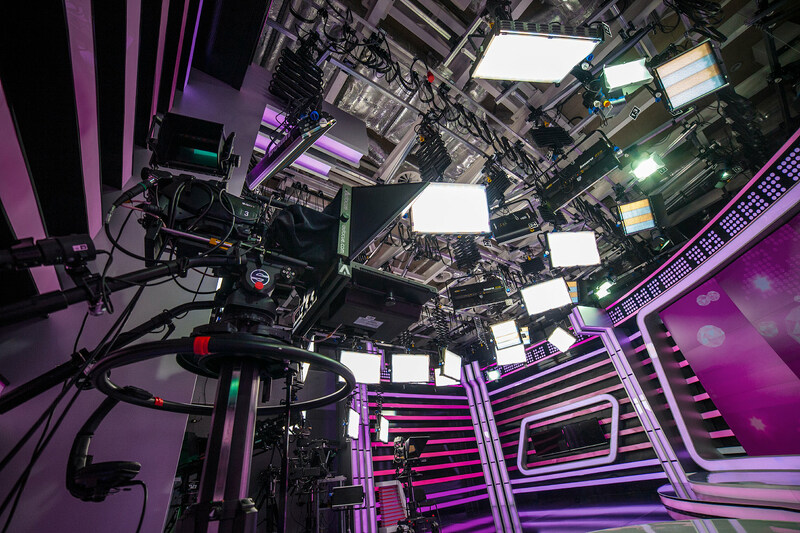 Power supply and control to the moving cross head in the studio by a special flat cable for individual cable rails, thus moving the traverse along the road does not require rewiring lighting. 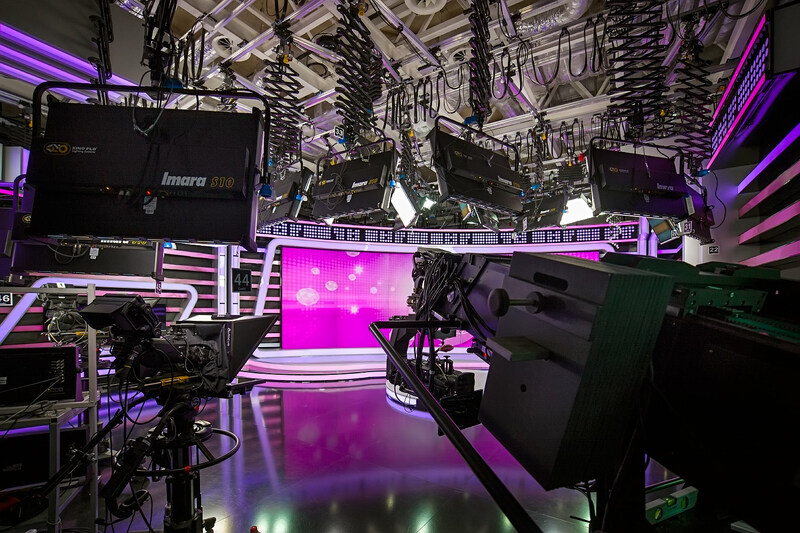 Along the perimeter of the studio set to connect the non-stationary lighting panels formed in solid body made of hard rubber by PCE production. Office lighting fixtures is carried out using the remote ETC Element, which provides the ability to manage both conventional and dynamic lighting fixtures. 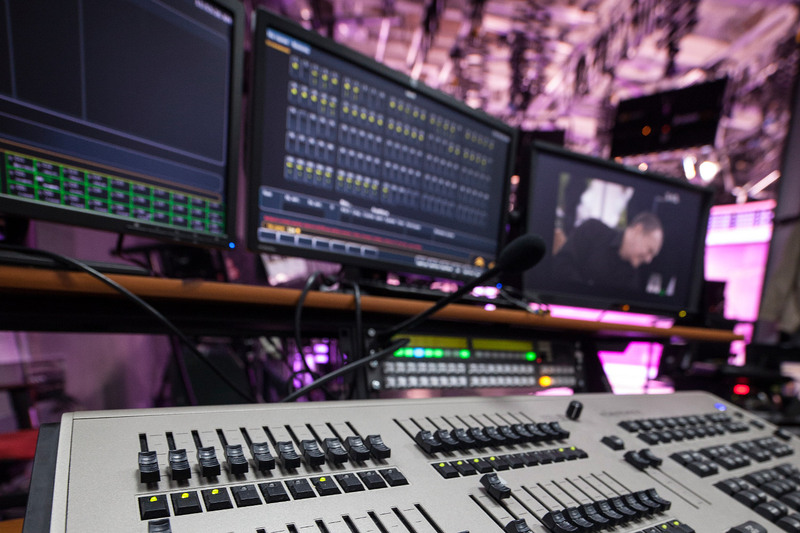 Provides direct access to the 120 control channels, and the total number of control channels - 250. This control is also used to control LED lighting decoration elements, allowing to form a variety of colors and color combinations, depending on the artistic intent. 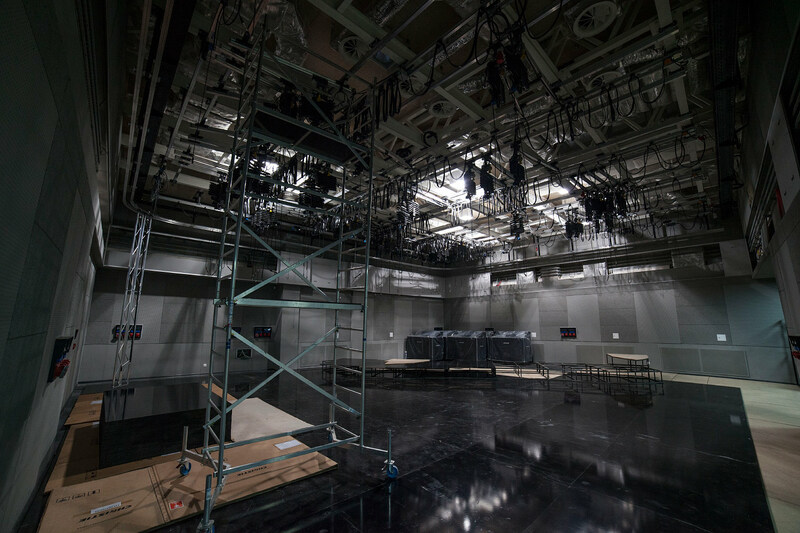 The task of creating the lighting and light decoration of the new pavilion was solved using the latest lighting technologies and solutions, including the latest development of the company ARRI - focusable lighting series LED L7 and new fluorescent IMARA devices from the company Kino Flo. 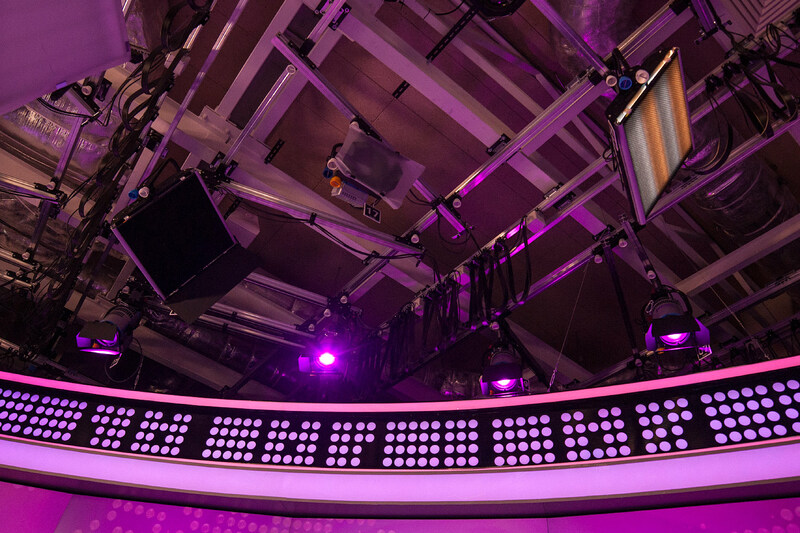 Have complete accessories required to control the luminous flux allows us to quickly and accurately build light scheme, taking into account the presence in the studio extensive glossy surface decoration and a huge video wall measuring 6x3 meters. Now we can work comfortably with such a large display surface in the frame. 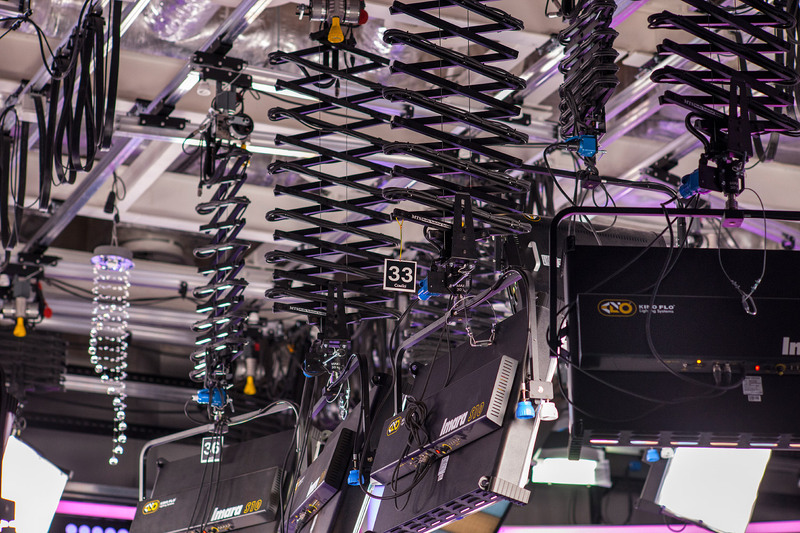 A combination of devices and IMARA ParaBeam from Kino Flo works very effectively, and new LED ARRI L7 devices perfectly complement them, allowing you to quickly work with any color temperatures and even color effects. 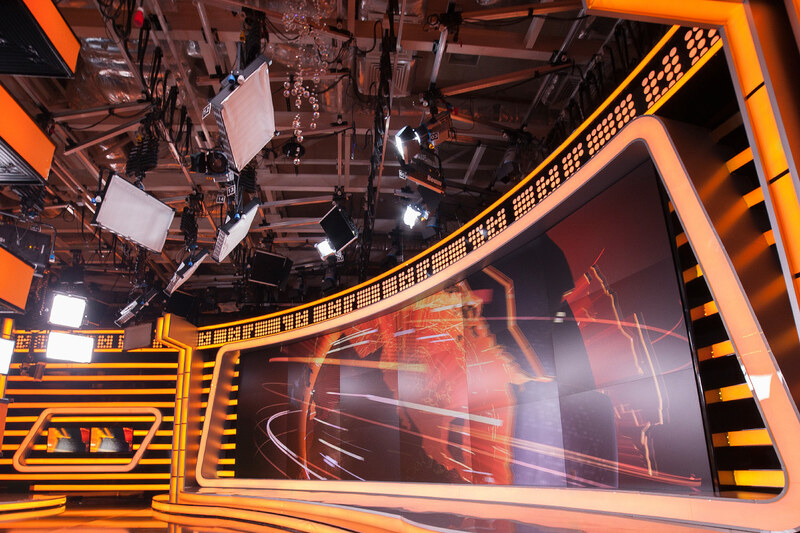 I visited with big pleasure this beautiful studio complex which lighting system is very flexible, well-chosen and professionally implemented in terms of new approaches to the studio lighting. I can say that this is one of the most modern, beautiful and technologically advanced television pavilions to date. I am honored to see our studio equipment in this beautiful studio, and I am pleased that they are in safe professional hands.